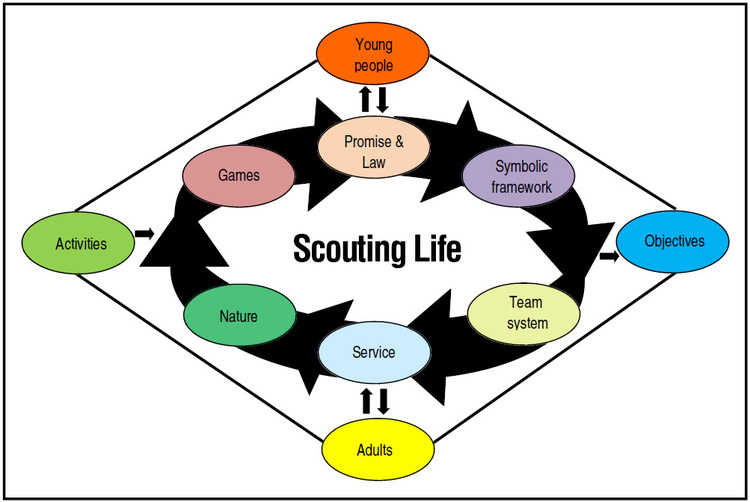 The Scout Method is an essential part of the Scout non-formal educational system. It may be defined as a program of progressive self-education, which is complementary to the family and school, and is based on the interaction of several key elements. The following are the key elements of the Scout Mehtod. It is possible to single out these elements. However, in order to understand the Scout Method we have to grasp how they work together in combination and appreciate the connections and processes between them. The Method is what it is because the elements that make it up are coordinated and balanced. If some instruments are missing from an orchestra, or out of tune or too loud, the totality will never sound tuneful and harmonious. Often the elements of the Method are analysed in an isolated and fragmented way, which hinders our understanding of how the whole works. If we take an equally fragmented approach to applying the method, we may expect only poor results. Like any other system, the Scout Method has certain dynamic complexity, but if we understand the links between the different parts, as leaders, we may gradually become familiar with these mechanisms and incorporate them naturally. Firstly, the Scout Method implies relationships between people: the young people and the adult leaders. 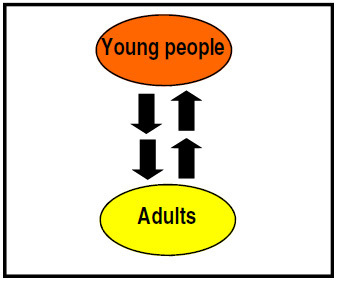 At the top of the diagram are the young people, and at the bottom are leaders, who are adults of different ages; with the arrows representing a two-way relationship between them. The contribution that young people make to their section, whether individually or through their teams. The interactive relationship of educational cooperation and mutual learning between young people, Leaders and the wider Scouting Family. The second relationship concerns the educational objectives and the activities, which help to attain them. At the sides of the diagram are the activities on the left and the young people's personal development objectives on the right, joined by arrows showing the relationship between them. That young people are asked to set themselves educational objectives which are agreed between each young person, the other members of the Team and the Leader who monitors their development. That the activities give the young people personal experiences which, little by little, enable them to achieve those objectives, with the help and mediation of their friends and Leaders. The Scout Law, a code of conduct that sets out the principles that guides us in language that is readily understood by the young people; and the Promise, a voluntary and personal commitment to live in accordance with the Scout Law. 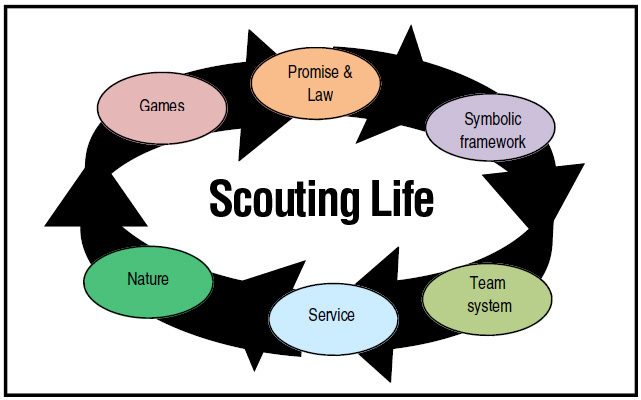 The symbolic framework, which conveys the Scout proposal to each age range, through various symbols. The Patrol System, which organizes the mechanisms of the informal peer group into a learning community and gives to each scout a role and a say in the decision-making process. Services to others, which is fostered by the habit of individual good turns and consists of activities and projects which bring the young people closer to those most in need, generating a willingness to serve. Life in nature, a special environment in which to carry out many of the activities of the section or, six, patrol and small groups. Learning by doing or, learning through play, which is attractive to young people, facilitates their integration into the group, helps them to discover their abilities and encourages an interest in exploring and adventure. In short, everything that happens as a result of the coordinated application of the Scout Method.